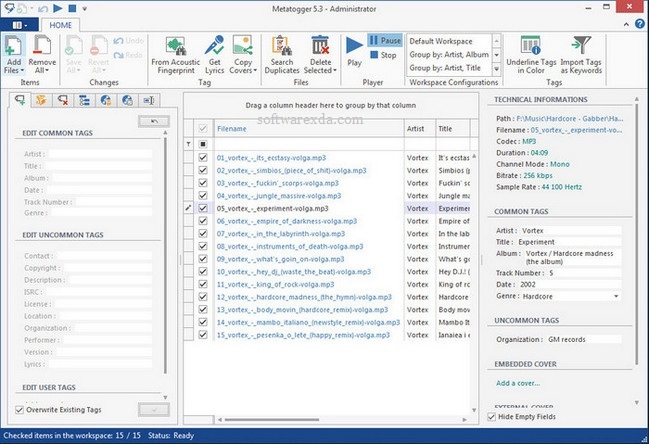 MetatOGGer is a comprehensive software application designed for managing your music collection when it comes to tagging, renaming and organizing audio tracks with the OGG and MP3 format. It primarily addresses users with some background in such apps. The interface of the utility is clean and intuitive. Importing audio tracks into the workspace is done by using either the file browser, folder view or “drag and drop” method; you can add as many items as you want. For each song in the list you can view the artist, title, date, album, genre and track number, as well as edit any of these fields by simply clicking them. An important feature of MetatOGGer lets you apply tailor-made tags, and all you have to do is write a name and value.